Stephen, Another honest and useful review that is really helpful. Thanks for sharing those thoughts. This goes on a ever growing wish list. Simon: I hope you do get round to reading it. This is one of those books that stays with you; so much so that I don’t think it will go away for a long time. It demands consideration. This sounds like a really good book. When I was younger, I remember reading many nuclear war aftermath books—”On the Beach” was one, but this sounds better. I just closed the cover on The Road and wanted to come back and read your review again now that I have finished. A remarkable book and your review is one of the best I’ve read. This was such a dark and difficult story but ultimately very rewarding – on many different levels. I’m going to have to do a lot more thinking about the end, however, because I’m still mulling it over. Verbivore: thanks for the compliment! This is one of the most thought provoking books I’ve ever read. It’s also a hard act to follow, and the way it haunts me probably has something to do with my current reading hiatus. Thanks for the review. I have just finished reading The Road and I found it sad and moving but ultimately a hopeful book. The work of an American master. 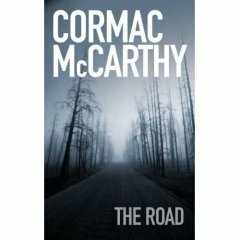 I will be reading more by McCarthy in the near future. I’m going to read this for the Saturday Review Challenge! I finished this book 3 weeks ago. This book will never ever ever leave me. I will have to read it again. I still find myself crying sometimes thinking about it, especially the ending…..... That little Boy was everything to His Pappa…..